Perfect Location, For Families & Groups, Quiet, Fully Equipped, 5mbs wifi. Casa Kiara is one of 4 family run homes in Panajachel that provide excellent service for families and small groups. (Please see our excellent reviews here at Casa Solhana # 467355). The home is extremely peaceful, very well located, fully equipped and serviced for up to 11 people. With volcano views from a large garden, and a sublime patio with beautiful outside fireplace this home is an ideal location for a visit to the Lake Atitlan area with your family and friends. Casa Kiara is 300m from Panajachel's main Santander street and 300m from the public beach and main docks for boat rides. The house is one of 2 houses in a gated community, surrounded by farm plots and trees. We guarantee hot water, comfy beds, and provide new equipment, fast internet and even a private cook and child care on request. The house comes with a large kid's pool, if required, a trampoline, kids games, flat screen TV and DVD player, 5mbs wifi, and all new kitchen appliances. The house is situated in a very quiet area of town, but still very close to Pana's main attractions. I am 46 years old and from the UK, I have lived in Guatemala for over 17 years. I have a degree in Tourism management and have mainly worked in this area for the last 25 years. I started a Hostel in Lanquin (Semuc Champey) when I was 29 and built a house there. About 10 years ago I moved to Panajachel with my wife from Washington State, and we live close to our home rental properties featured here, with our 8 and 6 year old girls. Casa Kiara is perfectly located close to the main tourist street of Panajachel, namely Calle Santander. It is one of 2 homes that we rent in a gated compound. (23 guests can sleep in both homes. )It is in a very quiet spot surrounded by trees and open fields, as well as a few homes, and is one of only 2 homes in a private gated community. Attention has been paid to detail, decoration and quality equipment as you can see from the photos. There are views of the volcanoes from the large garden. We appeal to families and small groups on holiday, and add facilities such as a large kids pool, games, and swings so that the children may be entertained while the parents relax. I manage only 4 homes in Panajachel so that I can give 5 star treatment to all our guests. Large outside patio with fireplace, back patio with BBQ, space for 10 people comfortably, new appliances, big garden, big kiddies pool, secure parking for 3 cars. Ideal for large groups of up to 22 people, as we rent the house next door also in a gated compound. Private cook and baby sitter available on request. Volcanoes can be seen from the garden. Outside patio and living room. plus living room / kitchen. Big new 6 burner Whirlpool gas stove. Filly equipped for up to 12 people, all new appliances, big stovw. over 100 English and Spanish channels. This bungalow allows for access to all areas. The casa is in a perfect location to enjoy all things Panajachel, but feels secluded and safe. Just outside the garden there are amazing views of the volcanos and the lake. The garden was perfect for the kids. They really enjoyed the trampoline and ping pong table. We were able to find everything we needed in the kitchen to prepare our meals. The beds were comfy and there were plenty of linens, including towels. We especially enjoyed the outdoor fireplace and we even got to roast marshmallows. We would definitely stay here again! Great home for our group of 6 friends to vacation together. All amenities we needed & beautiful garddens with spectacular lake & volcano views. Quiet area with short walk to town. Large, quiet oasis in a great location! We just returned from renting this property for one month while working in and out of Panajachel. 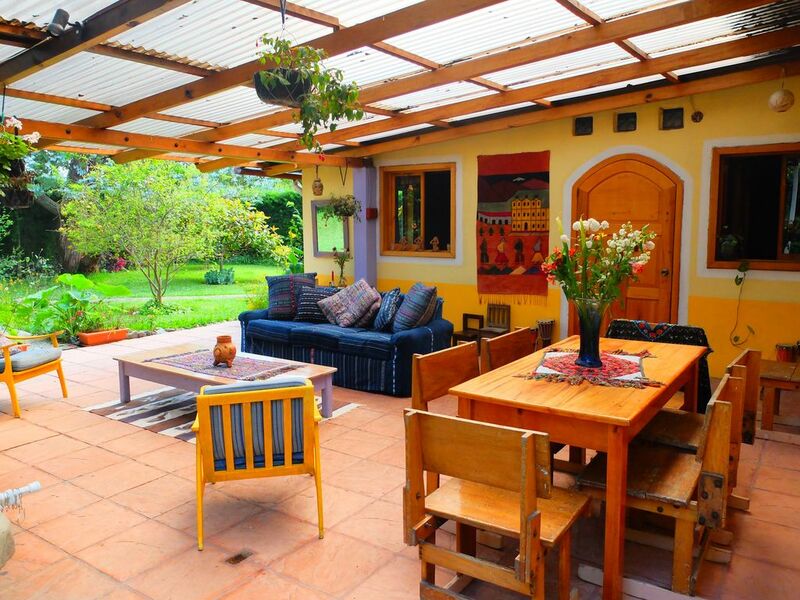 House is in a great location, well-equipped with a beautiful garden filled with plants, flowers & trees. The outside entertainment area is perfect for gatherings & the fireplace gives a warm touch to the entire area. Kitchen is well equipped, bedrooms are large & there are 3 bathrooms! Property is highly recommended! Thank you Matthew! Matt was a great host. House is very convenient location with a super outdoor fireplace that we loved. Communicating with Matt was seamless and efficient. While Casa Kiara is a bit difficult to find, Juana was available to phone to give us directions and meet us at the house when we arrived. She helped us with our bags and toured us through the house with graciousness. My 3 children, ages 15, 13, 12, felt like they had gone to heaven, after some of the places we had stayed in Guatemala earlier that week. They especially loved the mama and kittens that roamed the property and the prospect of using a ping pong table and trampoline. The master bathroom is "masterful" and the kids loved having their own secluded bedroom away from the main part of the house (though still attached). Beds were comfortable and fans were provided for those of us who need a bit of air circulation. The wifi is lightning speed and Matt provides a local cell phone for the renters' use (although we never could figure out how to get it to work! User error....). The only drawback for some might be that it is on a street that is "under development" and extremely dark at night - we needed to use our phone flashlights to make our way to the major part of town. Panajachel is the perfect hub from which you and your group can explore the Lake Atitlan area. This house is perfectly located only a few blocks from the main tourist center of Panajachel.